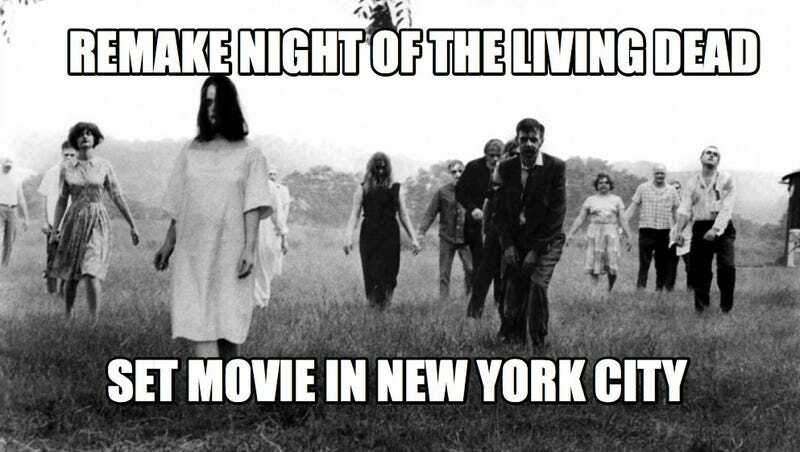 The Night of the Living Dead remake (Night of the Living Dead: Origins 3D) will be set in New York City, OBVIOUSLY. You know what? It's a surprise that we're surprised. According to Deadline, the remake of George Romero’s zombie-creating masterpiece will not actually be anything like the original. The 3D (yes, 3D) "re-imagining" will star Bollywood actor R. Madhavan (which, fine, whatever, some people are mad about the casting, that's not a big deal to us it) and will be set in NEW YORK CITY. Here, a group of survivors fighting barricade themselves in an abandoned New York apartment building when the zombie plague breaks out. It’s being shot in a CG setting using stereoscopic 3D, which, its makers suggest, becomes a hybrid of graphic novel and traditional animation. WHY BOTHER? Just make your urban zombie movie and be done with it! Stop paying for name cred and then shitting all over the fans. This is just ridiculous. So yeah, the new Night of the Living Dead will most likely not be anything like the old Night of the Living Dead based on the amount of human people that populate New York City versus rural Pennsylvania (where the original was filmed). Sigh.